Download "Chapter 16: Financial Risk Management"
2 RISK MANAGEMENT Introduction Chapter 15, Operational and Enterprise Risk Management, introduced the basic concepts of enterprise risk management, including a standard process for overall risk management: identify, measure, manage, and monitor. 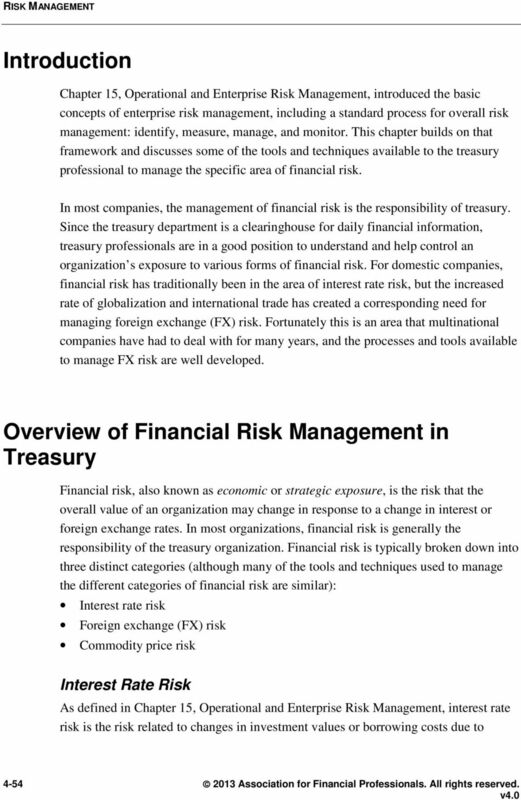 This chapter builds on that framework and discusses some of the tools and techniques available to the treasury professional to manage the specific area of financial risk. In most companies, the management of financial risk is the responsibility of treasury. Since the treasury department is a clearinghouse for daily financial information, treasury professionals are in a good position to understand and help control an organization s exposure to various forms of financial risk. For domestic companies, financial risk has traditionally been in the area of interest rate risk, but the increased rate of globalization and international trade has created a corresponding need for managing foreign exchange (FX) risk. Fortunately this is an area that multinational companies have had to deal with for many years, and the processes and tools available to manage FX risk are well developed. Overview of Financial Risk Management in Treasury Financial risk, also known as economic or strategic exposure, is the risk that the overall value of an organization may change in response to a change in interest or foreign exchange rates. In most organizations, financial risk is generally the responsibility of the treasury organization. 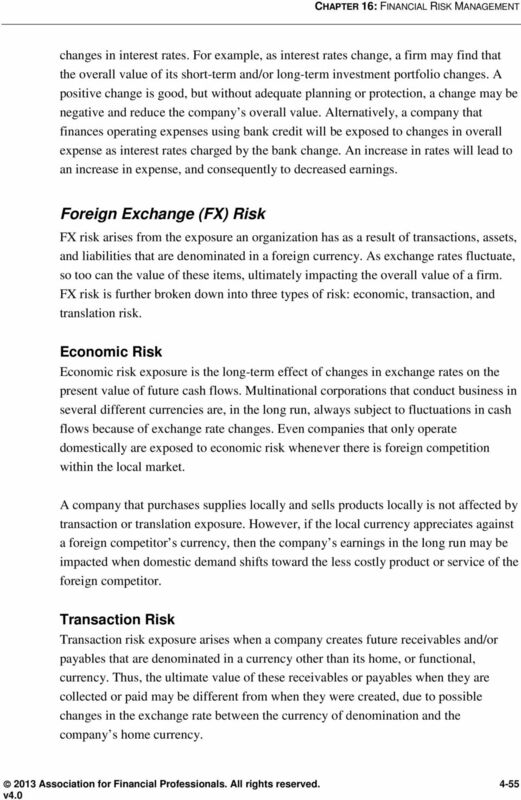 Financial risk is typically broken down into three distinct categories (although many of the tools and techniques used to manage the different categories of financial risk are similar): Interest rate risk Foreign exchange (FX) risk Commodity price risk Interest Rate Risk As defined in Chapter 15, Operational and Enterprise Risk Management, interest rate risk is the risk related to changes in investment values or borrowing costs due to Association for Financial Professionals. All rights reserved. 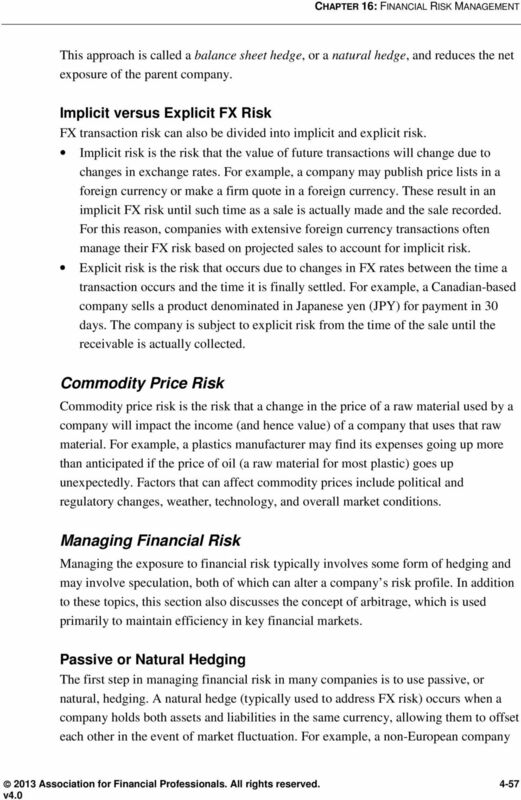 4 RISK MANAGEMENT This is the most common type of FX risk exposure to be hedged through the use of currency derivatives. Explicit transaction risk exposure begins when a receivable or payable is entered on the balance sheet and remains until cash is received or paid. For example, when a Japanese exporter sells merchandise to a French buyer and agrees to accept payment in euros (EUR) in three months, the transaction is recorded in revenue and in accounts receivable using the Japanese yen (JPY) equivalent value of the euro at that time. However, the value of the receivable changes as the value of the euro changes against the yen over the following three months. These gains and losses are typically recorded on the income statement at the end of each accounting period, creating earnings volatility. 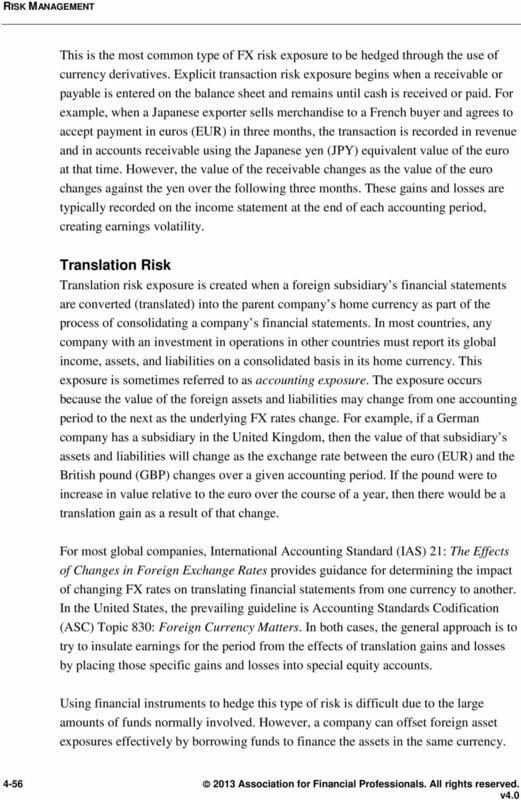 Translation Risk Translation risk exposure is created when a foreign subsidiary s financial statements are converted (translated) into the parent company s home currency as part of the process of consolidating a company s financial statements. In most countries, any company with an investment in operations in other countries must report its global income, assets, and liabilities on a consolidated basis in its home currency. This exposure is sometimes referred to as accounting exposure. The exposure occurs because the value of the foreign assets and liabilities may change from one accounting period to the next as the underlying FX rates change. For example, if a German company has a subsidiary in the United Kingdom, then the value of that subsidiary s assets and liabilities will change as the exchange rate between the euro (EUR) and the British pound (GBP) changes over a given accounting period. If the pound were to increase in value relative to the euro over the course of a year, then there would be a translation gain as a result of that change. For most global companies, International Accounting Standard (IAS) 21: The Effects of Changes in Foreign Exchange Rates provides guidance for determining the impact of changing FX rates on translating financial statements from one currency to another. In the United States, the prevailing guideline is Accounting Standards Codification (ASC) Topic 830: Foreign Currency Matters. In both cases, the general approach is to try to insulate earnings for the period from the effects of translation gains and losses by placing those specific gains and losses into special equity accounts. Using financial instruments to hedge this type of risk is difficult due to the large amounts of funds normally involved. However, a company can offset foreign asset exposures effectively by borrowing funds to finance the assets in the same currency Association for Financial Professionals. All rights reserved. 6 RISK MANAGEMENT that expects to earn future revenue in euros might arrange to finance part of its facilities with a euro-based loan. To the extent that the future earnings in euros match the loan payments in euros, the company is unaffected by changes in the value of the euro. Passive hedging strategies include borrowing and investing using currencies other than the organization s home currency (i.e., creating natural hedges), and can also include decisions around fixed versus floating borrowing, balance sheet matching, and fixed-price supplier agreements. 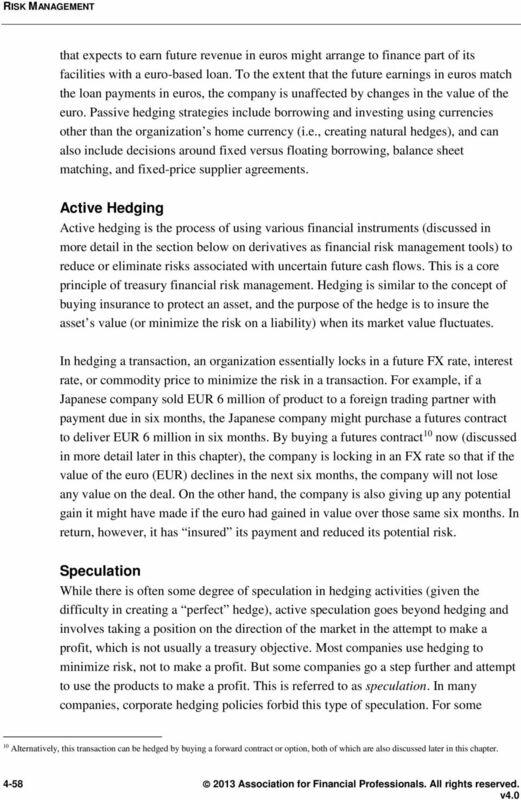 Active Hedging Active hedging is the process of using various financial instruments (discussed in more detail in the section below on derivatives as financial risk management tools) to reduce or eliminate risks associated with uncertain future cash flows. This is a core principle of treasury financial risk management. Hedging is similar to the concept of buying insurance to protect an asset, and the purpose of the hedge is to insure the asset s value (or minimize the risk on a liability) when its market value fluctuates. In hedging a transaction, an organization essentially locks in a future FX rate, interest rate, or commodity price to minimize the risk in a transaction. For example, if a Japanese company sold EUR 6 million of product to a foreign trading partner with payment due in six months, the Japanese company might purchase a futures contract to deliver EUR 6 million in six months. By buying a futures contract 10 now (discussed in more detail later in this chapter), the company is locking in an FX rate so that if the value of the euro (EUR) declines in the next six months, the company will not lose any value on the deal. On the other hand, the company is also giving up any potential gain it might have made if the euro had gained in value over those same six months. In return, however, it has insured its payment and reduced its potential risk. Speculation While there is often some degree of speculation in hedging activities (given the difficulty in creating a perfect hedge), active speculation goes beyond hedging and involves taking a position on the direction of the market in the attempt to make a profit, which is not usually a treasury objective. Most companies use hedging to minimize risk, not to make a profit. But some companies go a step further and attempt to use the products to make a profit. This is referred to as speculation. In many companies, corporate hedging policies forbid this type of speculation. 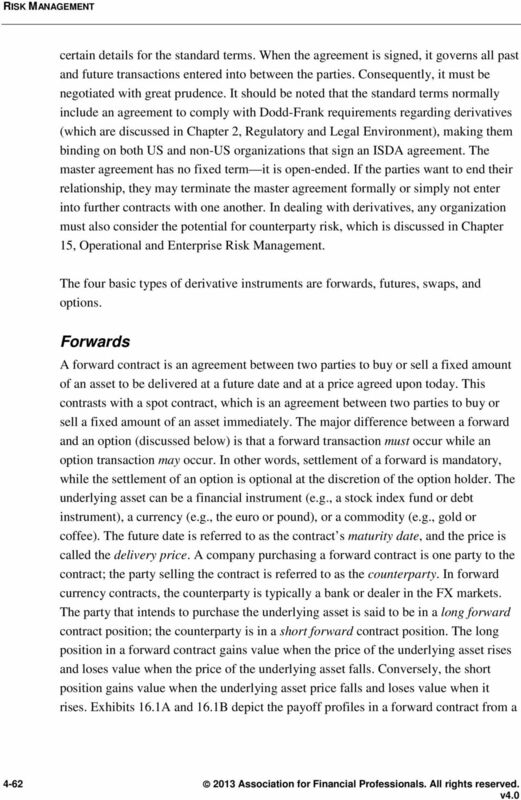 For some 10 Alternatively, this transaction can be hedged by buying a forward contract or option, both of which are also discussed later in this chapter Association for Financial Professionals. All rights reserved. 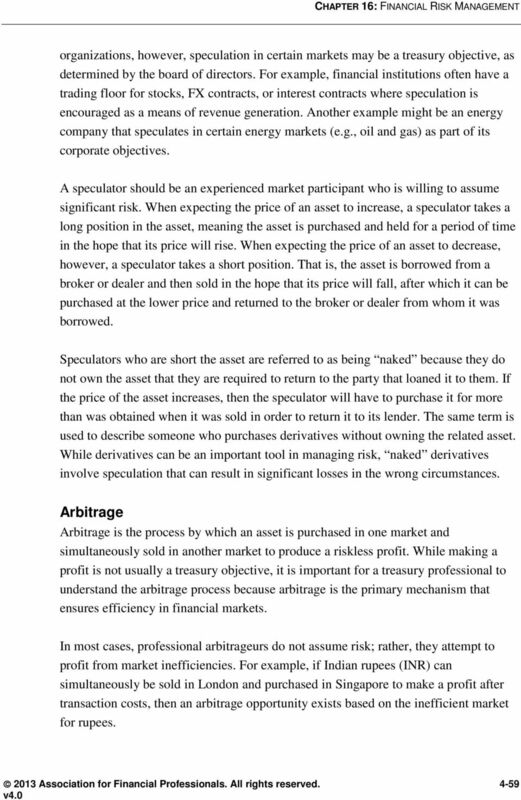 8 RISK MANAGEMENT Another example of arbitrage is referred to as covered interest arbitrage. 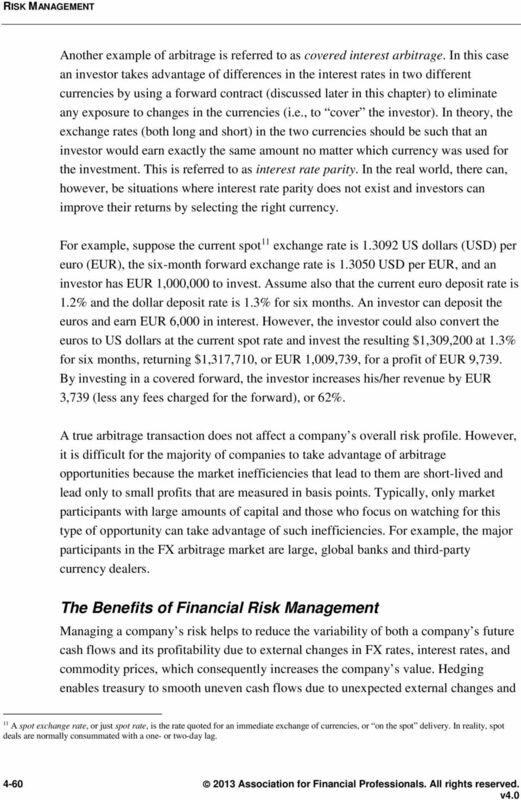 In this case an investor takes advantage of differences in the interest rates in two different currencies by using a forward contract (discussed later in this chapter) to eliminate any exposure to changes in the currencies (i.e., to cover the investor). In theory, the exchange rates (both long and short) in the two currencies should be such that an investor would earn exactly the same amount no matter which currency was used for the investment. This is referred to as interest rate parity. In the real world, there can, however, be situations where interest rate parity does not exist and investors can improve their returns by selecting the right currency. For example, suppose the current spot 11 exchange rate is US dollars (USD) per euro (EUR), the six-month forward exchange rate is USD per EUR, and an investor has EUR 1,000,000 to invest. Assume also that the current euro deposit rate is 1.2% and the dollar deposit rate is 1.3% for six months. An investor can deposit the euros and earn EUR 6,000 in interest. However, the investor could also convert the euros to US dollars at the current spot rate and invest the resulting $1,309,200 at 1.3% for six months, returning $1,317,710, or EUR 1,009,739, for a profit of EUR 9,739. By investing in a covered forward, the investor increases his/her revenue by EUR 3,739 (less any fees charged for the forward), or 62%. A true arbitrage transaction does not affect a company s overall risk profile. However, it is difficult for the majority of companies to take advantage of arbitrage opportunities because the market inefficiencies that lead to them are short-lived and lead only to small profits that are measured in basis points. Typically, only market participants with large amounts of capital and those who focus on watching for this type of opportunity can take advantage of such inefficiencies. For example, the major participants in the FX arbitrage market are large, global banks and third-party currency dealers. The Benefits of Financial Risk Management Managing a company s risk helps to reduce the variability of both a company s future cash flows and its profitability due to external changes in FX rates, interest rates, and commodity prices, which consequently increases the company s value. Hedging enables treasury to smooth uneven cash flows due to unexpected external changes and 11 A spot exchange rate, or just spot rate, is the rate quoted for an immediate exchange of currencies, or on the spot delivery. In reality, spot deals are normally consummated with a one- or two-day lag Association for Financial Professionals. All rights reserved. 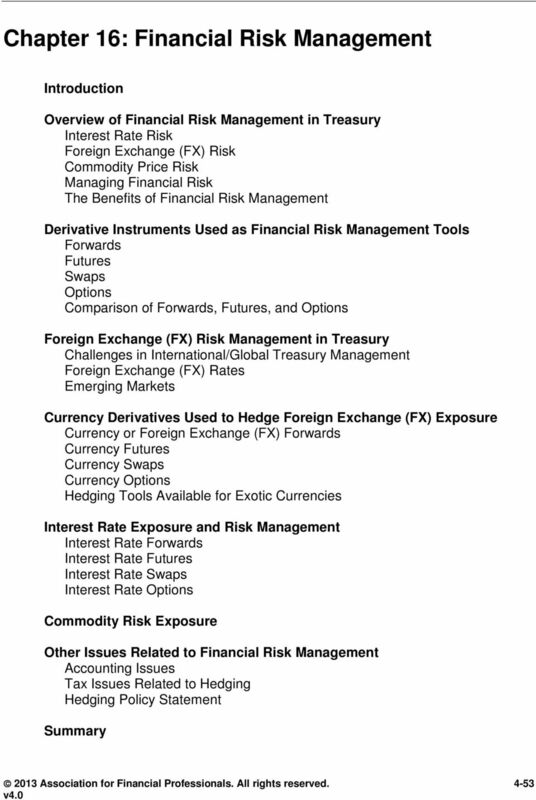 10 RISK MANAGEMENT certain details for the standard terms. When the agreement is signed, it governs all past and future transactions entered into between the parties. Consequently, it must be negotiated with great prudence. It should be noted that the standard terms normally include an agreement to comply with Dodd-Frank requirements regarding derivatives (which are discussed in Chapter 2, Regulatory and Legal Environment), making them binding on both US and non-us organizations that sign an ISDA agreement. The master agreement has no fixed term it is open-ended. If the parties want to end their relationship, they may terminate the master agreement formally or simply not enter into further contracts with one another. In dealing with derivatives, any organization must also consider the potential for counterparty risk, which is discussed in Chapter 15, Operational and Enterprise Risk Management. The four basic types of derivative instruments are forwards, futures, swaps, and options. Forwards A forward contract is an agreement between two parties to buy or sell a fixed amount of an asset to be delivered at a future date and at a price agreed upon today. This contrasts with a spot contract, which is an agreement between two parties to buy or sell a fixed amount of an asset immediately. 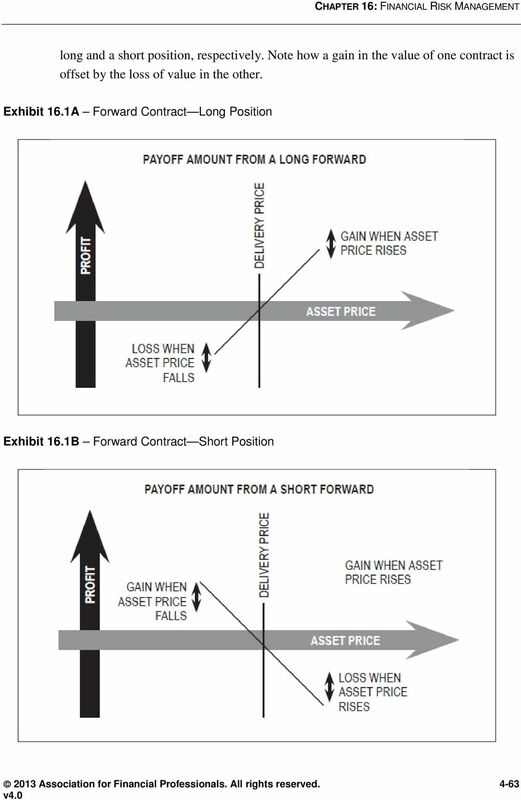 The major difference between a forward and an option (discussed below) is that a forward transaction must occur while an option transaction may occur. In other words, settlement of a forward is mandatory, while the settlement of an option is optional at the discretion of the option holder. The underlying asset can be a financial instrument (e.g., a stock index fund or debt instrument), a currency (e.g., the euro or pound), or a commodity (e.g., gold or coffee). The future date is referred to as the contract s maturity date, and the price is called the delivery price. A company purchasing a forward contract is one party to the contract; the party selling the contract is referred to as the counterparty. In forward currency contracts, the counterparty is typically a bank or dealer in the FX markets. The party that intends to purchase the underlying asset is said to be in a long forward contract position; the counterparty is in a short forward contract position. The long position in a forward contract gains value when the price of the underlying asset rises and loses value when the price of the underlying asset falls. 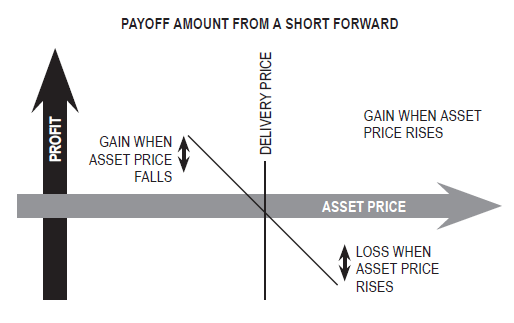 Conversely, the short position gains value when the underlying asset price falls and loses value when it rises. Exhibits 16.1A and 16.1B depict the payoff profiles in a forward contract from a Association for Financial Professionals. All rights reserved. Derivative Users Traders of derivatives can be categorized as hedgers, speculators, or arbitrageurs. INR Volatility - Hedging Options & Effective Strategies The purpose of the article is to draw attention on the recent volatility in Indian Rupee, various hedging options and effective hedging strategies. Bendigo Foreign Exchange Swap Contracts. Product Disclosure Statement. DERIVATIVE ADDITIONAL INFORMATION I. 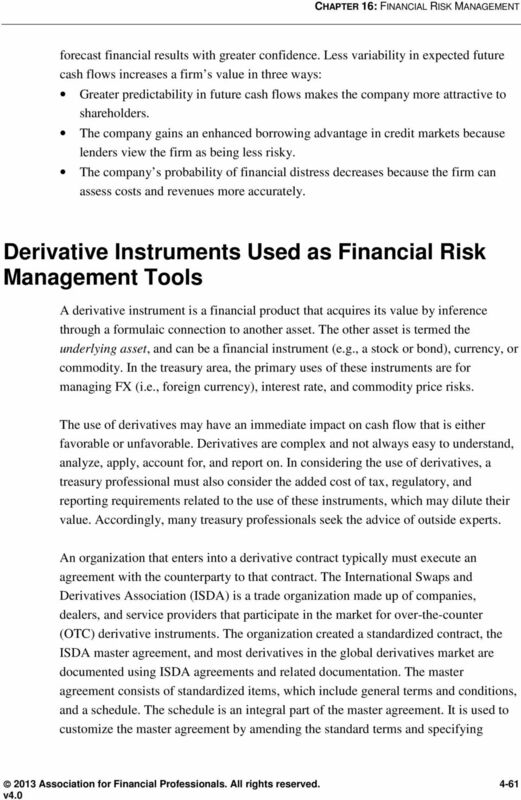 DERIVATIVE INSTRUMENTS AND HEDGING ACTIVITIES A. Definitions and Concepts 1. Derivative Instrument A "derivative instrument" is a financial instrument that "derives"
Bendigo Foreign Exchange Contracts. Product Disclosure Statement. 1. HOW DOES FOREIGN EXCHANGE TRADING WORK? CommSec CFDs: Introduction to FX Important Information This brochure has been prepared without taking account of the objectives, financial and taxation situation or needs of any particular individual. Financial-Institutions Management. Solutions 4. 8. The following are the foreign currency positions of an FI, expressed in the foreign currency. Your Guide to Foreign Exchange. Strategies for managing risk and making payments worldwide. This document has been translated from the Japanese original for reference purposes only. In the event of discrepancy between this translated document and the Japanese original, the original shall prevail.